Today at 2 p.m. Eastern Standard Time, be sure to participate in the #InvestInKids Tweetchat. It’s going to be a lively, hour-long Twitter conversation about early learning and the federal Strong Start for America’s Children Act, which would expand early learning opportunities for children age birth to five. The Tweetchat, a bipartisan effort, is being sponsored by the National Women’s Law Center (NWLC). “We have a variety of great guests confirmed – Representatives George Miller and Richard Hanna, Mark Shriver, Senior Vice President for Strategic Initiatives at Save the Children, and Marian Wright Edelman, Founder and President of Children’s Defense Fund. Stay tuned for even more special guests!” NWLC said in an email. 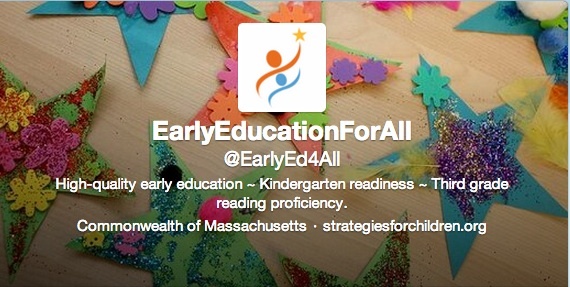 Strategies for Children will be tweeting @EarlyEd4all and so will Amy O’Leary, our Early Education for All campaign director. Don’t have a Twitter account? Sign up here. It’s easy. – Promote the chat this morning using yours or your organization’s Twitter handle along with @NWLC and #InvestInKids. – During the Tweetchat, pose questions about early learning. – Share your reasons why investing in children is so crucial. – Use the NWLC photograph featured in this blog. See you this afternoon in the Twittersphere.